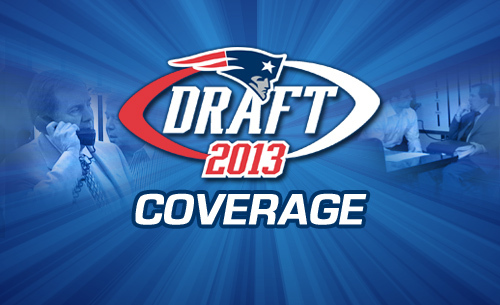 In about three hours the New England Patriots will be on the clock. Even though head coach Bill Belichick and the war room actually traded up last year, drafting defensive impact players Chandler Jones and Dont’a Hightower, there is a sense of a return to normalcy this season as the Pats will likely be up to their old tricks, trading down to accrue more selections, especially this season as their normal glut of selections is quite bare by Patriots standards. However, lets surmise that New England actually stays put at No. 29. They will have several players to choose as the board is currently laid out and a player or two that could slide to the Pats and force them to pull the trigger on a player as opposed to a deal that would get them a future first or second round pick or extra second or third (and don’t count out another late round sixth or seventh for good measure). It’s obvious that the Patriots have a need at wide receiver but adding depth at the cornerback, defensive line, linebacker, safety and offensive live spots is also prevalent. If New England stays put (which we all know is highly unlikely) here is a list of players that could be joining the Patriots in just over 200 minutes. The perfect match of need and talent late in the first round. If he’s there, Patriots will definitely have to look at it, but there have been questions about his ability to grasp a complex playbook after a low wonderlic score. Rhodes would need a big slide to reach the Pats, but New England would definitely pull the trigger if he was still there. A big body that fills a need in depth on the line. The likely pick at corner should the Patriots stand pat and choose to go with secondary selection. Another player that is not expected to be available at 29, but an immediate impact player in the secondary. The player opposite Cordarelle Patterson, but a good player in his own right and the possible pick if the Patriots decide they need a wide receiver. There have been plenty of knocks on Elam through the draft process, which means he’ll be available, but likely still there in the early second round as well. An imposing force on the front line that would be an intriguing combo with Vince Wilfork. Could be the pick for the Pats. After the departures of Welker & Lloyd, the Patriots have been linked to just about every available wide receiver. See! Williams took a back seat to Josh Gordon last year and lost Griffin this season but is still a solid player. Again, may be gone by 29 just like Rhodes & Cyprien, but would be a welcome addition to the secondary corps. I just said Taylor would be gone, and there is no chance Hayden is still there when the Pats pick… but hey, crazier things have happened. St. Louis was linked to Hopkins in the early going after losing Amendola, but buzz has cooled as of late. Could slip to Pats. The thought of this guy and Ninkovich on the ends with Chandler Jones running people down from all angles is scary. Might not be a bad idea for the Patriots to look at.